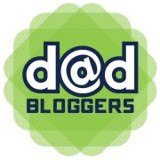 Daddy's Ford Journey to the Pro Football Hall of Fame | Daddy's in Charge? My wife is not a football fan. Sure she likes to watch our seven year old Carter play, but she has no idea who any of the players are (aside from the obvious ones like Tom Brady) and certainly has no clue about who is in the Hall of Fame. 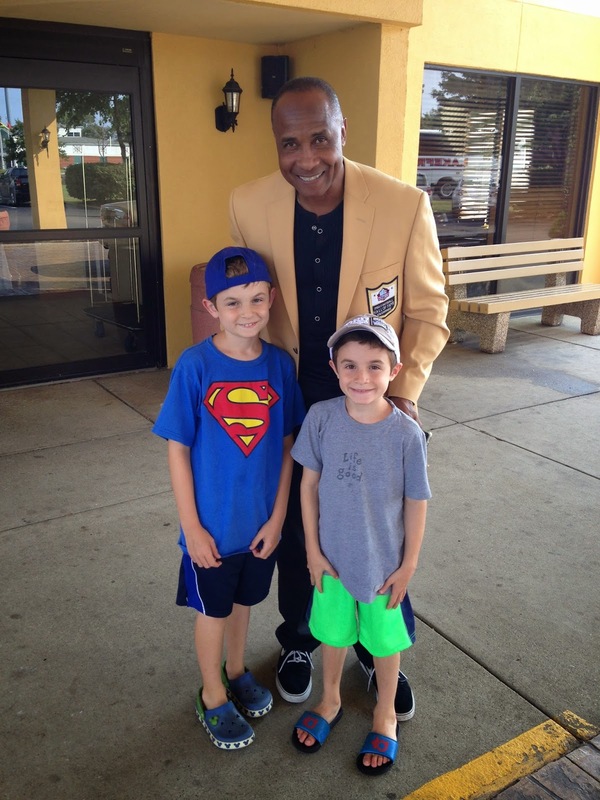 Lynn Swann could be Gale Sayers for all she knew. Or Dan Marino could be Joe Montana. The point is, football is not her thing... at least it wasn't anyway. 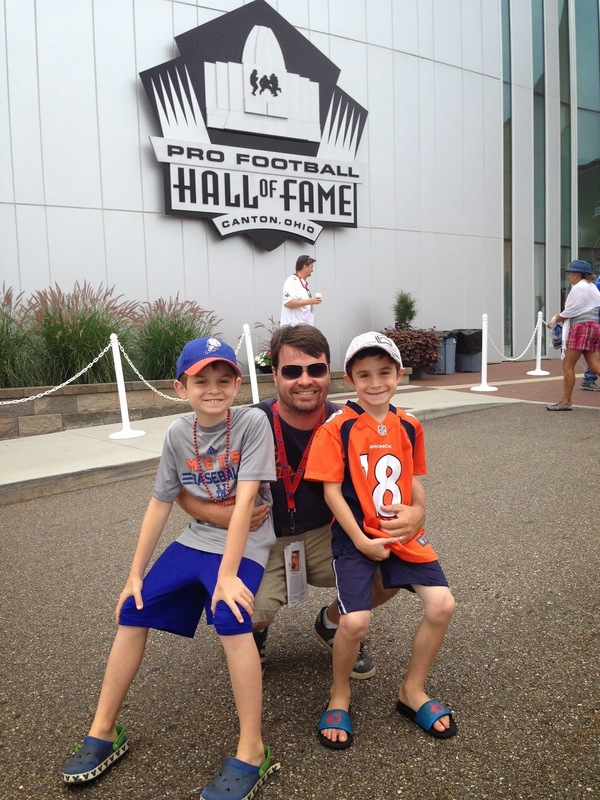 I was approached by the Tri-State Ford Dealers to drive out to the Pro Football Hall of Fame in Canton, Ohio with my family. 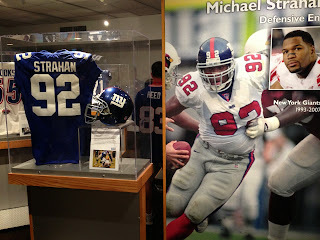 Since the Giants are one of our local teams and Michael Strahan was getting enshrined this year they wanted me of all people to cover it for them. 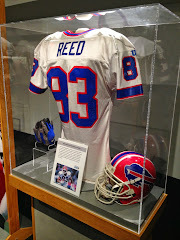 Now I am an admitted Bills fan (I used to be a Steelers fan and a Dolphins fan before I realized that I should be rooting for the local team from where I grew up) but I would never let that get in the way of my fairly covering a player for the Giants. Strahan is one of the best defensive linemen in the history of the game and deserving of this honor. So it was off the Canton we went. I had no idea what to expect when the car came and was excited to see my very own hashtag on the rear bumper. Of course with a hashtag on the rear bumper comes great responsibility. There would be no speeding and reckless driving of any kind (not that there would be of course) on this trip. We got a late start due to the fact that my wife had to work late. It explains why she is so dressed up and I look like a slob. This worked out OK though as we wanted to get at least a little bit of driving done so we didn't have to tackle the entire eight hour day in one shot. Of course when you start out TOO late, everyone falls asleep in about an hour and it's up to you to find a hotel at 2:00 in the morning. Thankfully I had the Fords navigation system to keep me company and it found me a hotel outside of Hazelton, PA for us to spend the night. Day two was all about getting to Canton. There would be no stops along the way... at least planned stops anyway. It's my opinion that, for the most part, any road trip is about the destination and not so much the journey. When you have been on as many trips as I have, you understand where I am coming from. Of course you do have to stop sometimes... the kids have to eat after all. 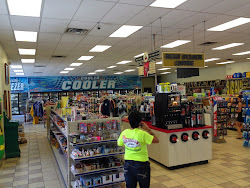 We stopped at a truck stop that if I had too rate it, I would give it a negative two. There was a funk to it, but the bathrooms were somewhat clean. The sandwiches were moldy and the candy was hard as a rock. Needless to say, this must not be a very busy truck stop. We filled up with gas and I noticed a very cool feature with the Ford Explorer that I hadn't seen before. 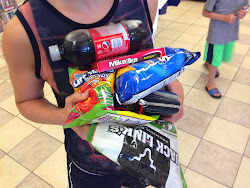 Of course we forget to get Carter a package of Skittles so ANOTHER emergency stop was in order. The boy loves his candy more than life itself. 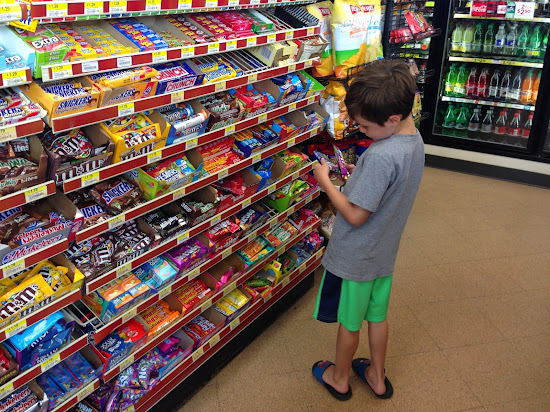 I know that you are thinking we could have held off and just not let him have the Skittles, but seriously who wants to put up with that kid of screaming when we didn't know how much longer it was going to take. This leads me to an observation... Pennsylvania is the widest state that I have ever driven across. It absolutely took forever. 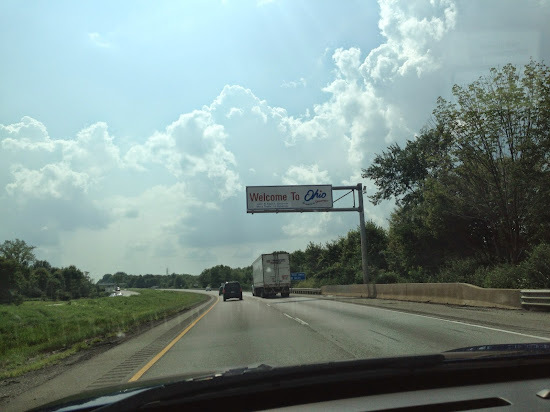 It was beautiful with it's rolling hills and rivers that you would cross every few miles it seemed, but I have never looked forward to a sign like this one as I did on that drive. Of course arriving in Ohio still meant that we had another two hours to go until we arrived in Canton. I like driving, but this was getting ridiculous and the boys were getting antsy. Any future plans that I had to take the boys on a long road trip are now out the window. I am NOT looking forward to our drive to Chicago at the end of the summer. With all that being said, the weekend more than made up for how long the drive took. We were at our hotel for about 10 minutes and we ran into this guy in the elevator. It's crazy to think that we were sharing our hotel with one of the greatest receivers to ever play football. When I was a kid Carter's age, he was my guy. Whenever I was playing catch I WAS Lynn Swann and now I am sharing an elevator with him. Certainly this was a sign of things to come. 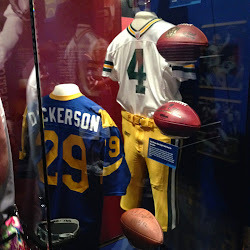 I had never been to the Pro Football Hall of Fame. It's always been a place that I wanted to go. I am a fan of the past and of the players that time has forgotten about. In order to appreciate today's game, I think it's important to know a little history of the game and the players that paved the way. I love that my boys share that same passion. 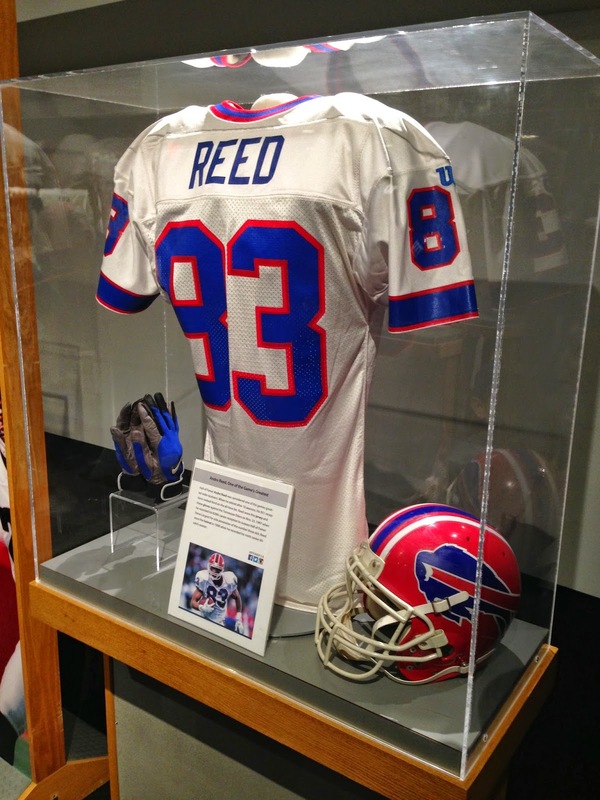 Of course you couldn't pick a better weekend to visit that Hall than Enshrinement Weekend. History is on display all over the grounds of the Hall of Fame, inside and out. 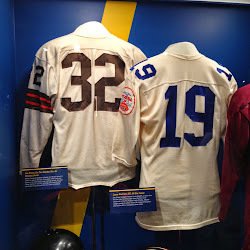 There is something about seeing the old jerseys. They don't look as generic as today's do. You can almost sense that there was some old lady who cut out the numbers herself and hand stitched every single one of them. While this was a GREAT weekend to visit the Hall, it was also the busiest weekend to visit. 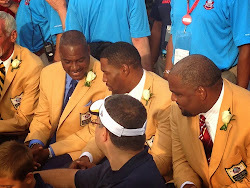 The crowds were huge, which is understandable, seeing as how Michael Strahan and Andre Reed were two of the inductees. 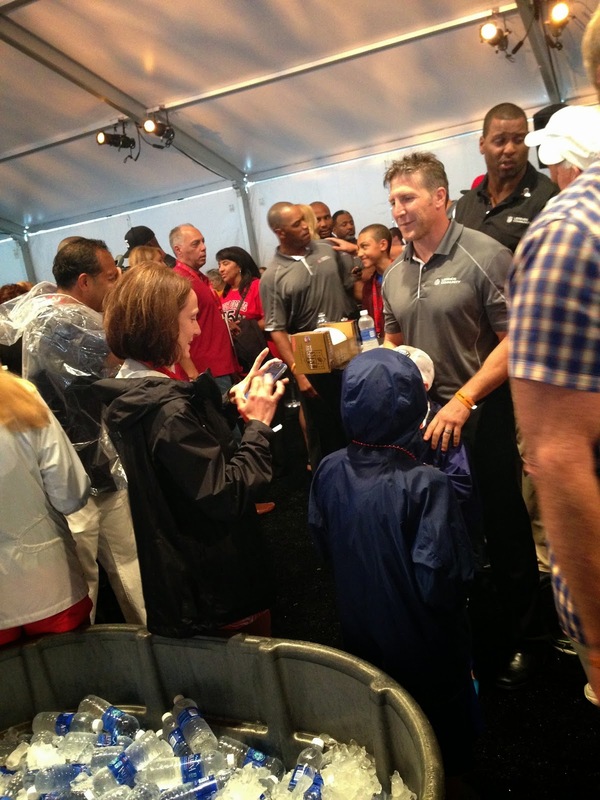 One of the highlights for me was a fan tailgate party prior to the induction ceremony. While we didn't meet the inductees themselves, we did meet a lot of their family members. It's very interesting talking to Andre Reed's older brother about what it was like growing up with a future hall of famer and more interesting still dancing with Derrick Brooks entire extended family. It's nice to see where these guys are from and how important family is to all of them. It's also nice to have a wife that isn't a huge football fan so she has no issue with going up to people and asking them if the played the game at all. Turns out, the best way to introduce yourself to an athlete is by telling them that you have no idea who they are. 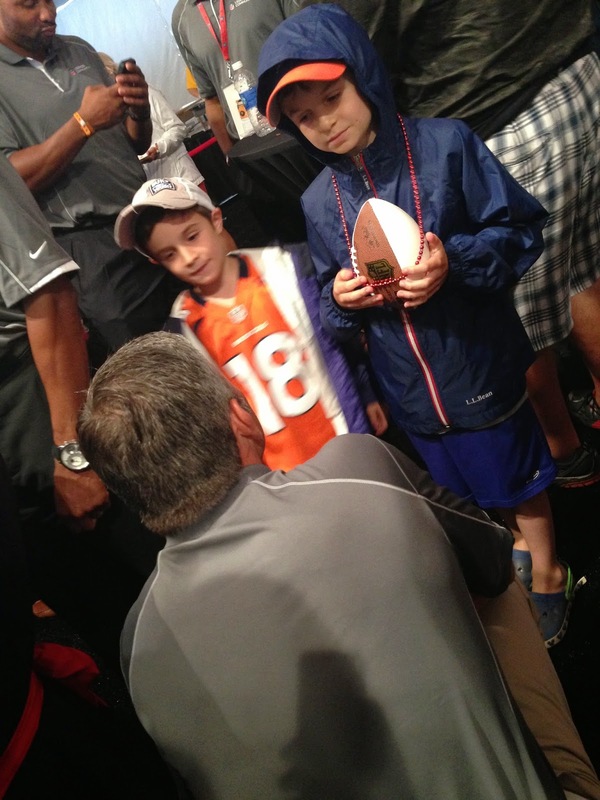 Without that, my son would not have had a personal conversation with former NFL quarterback Marc Brunell. Two lefty football players discussing the nuances of the game. 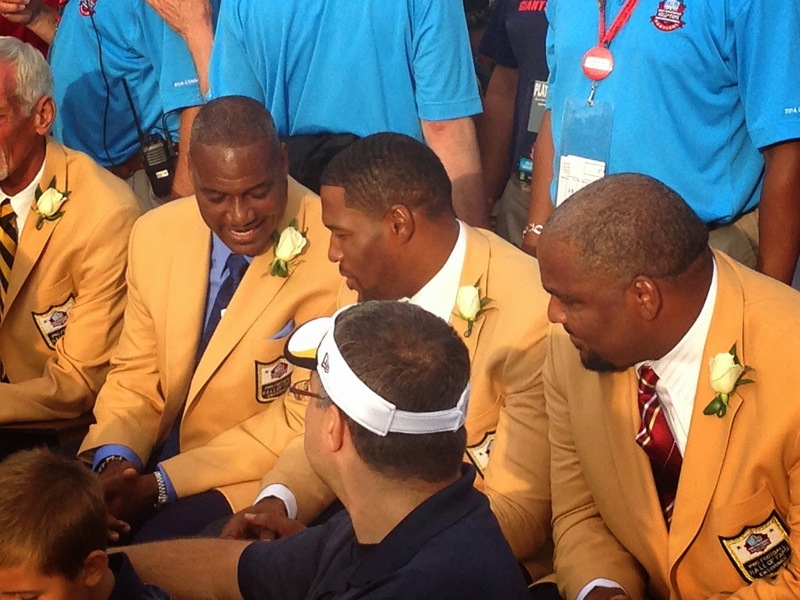 Of course the main reason that we were there was to watch the players get inducted into the Hall of Fame. It's easily the highlight of the weekend for most people. I wasn't sure that my kids would be able to sit through all of the speeches, but they did. They also quoted their speeches to the players when we met them the next day. The thing that struck me about each of these guys speeches was that there wasn't much mention of their fathers. Each and every single one of them had two things to thank; God and their mother. While dad wasn't completely nonexistent, it was always the talk of their hard working mothers that made the tears flow. So if you want your kid to be a Hall of Fame athlete, make sure that mom is involved every step of the way. The game the next day was somewhat inconsequential in comparison to the rest of the weekend. 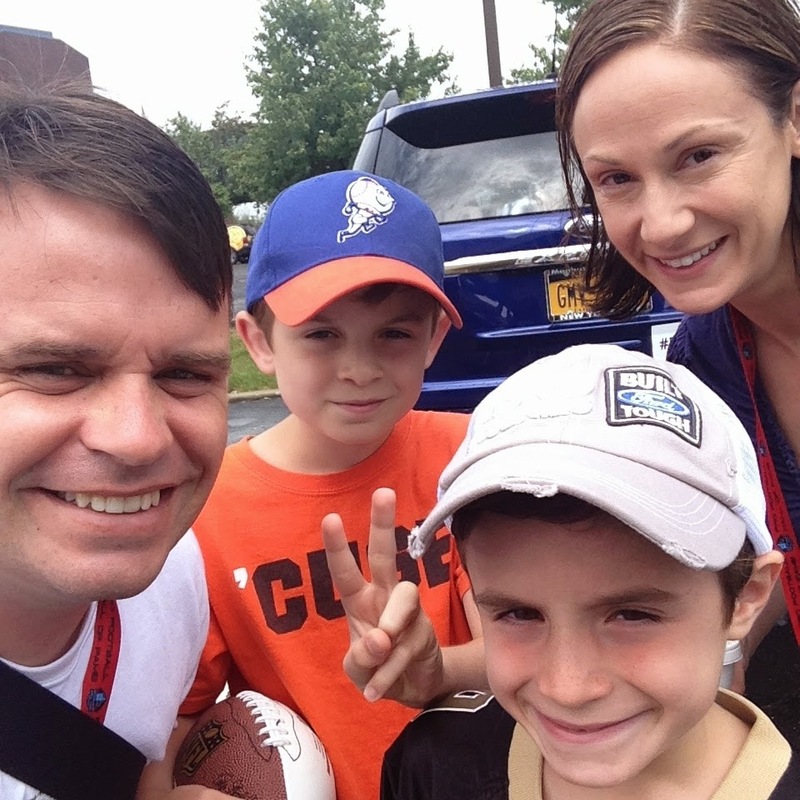 The only thing that I will remember from it is that it was my kids first pro football game. I don't even know who won, nor do I care really. What I care about the most is that my kids soaked up every single moment. The only problem with the weekend was that when it was over, we had to drive back to New Jersey. I wasn't looking forward to that drive through Pennsylvania again. I don't know how in the heck people drive from one end of Texas to the other. While the scenery is beautiful, sometimes you just need to know that you are in another state. Carter got so bored with Pennsylvania he fell asleep before we even got home. 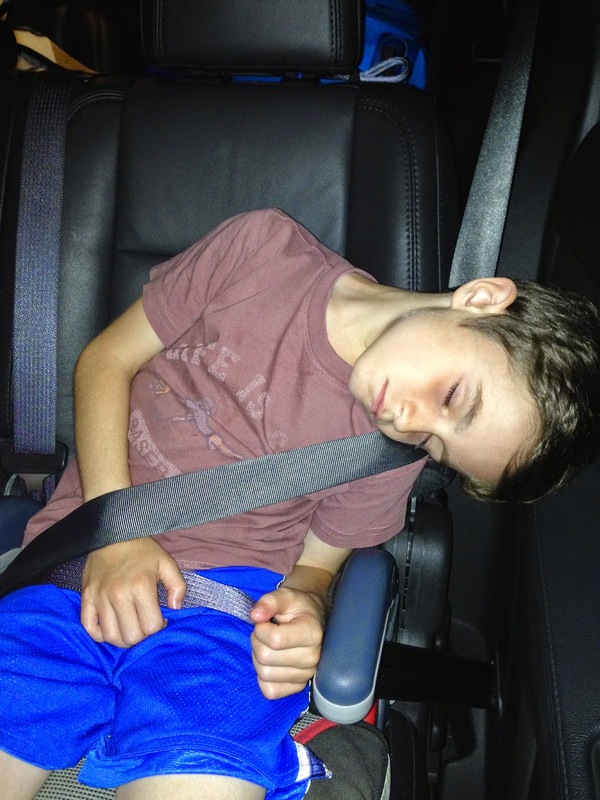 Those seat belts have an air bag in them by the way and yes I know that this wasn't the safest way for him to ride, but you can't help when your kid decides that he just wants to sleep... I'm certainly not going to stop him. Even the Ford Explorer can't help when your kid is having a meltdown somewhere in the Poconos. I must thank the fine people from the Tri-State Ford dealers for making this trip possible. It was truly the trip of a lifetime and one that I won't soon forget. It was also a trip that made my wife a football fan... at least for one weekend anyway. 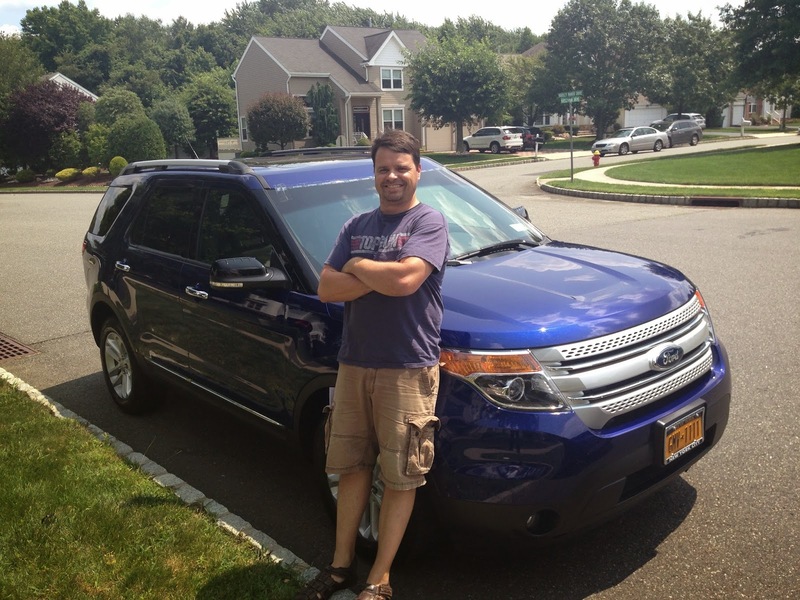 I was provided a 2014 Ford Explorer by the Tri-State Ford Dealers and was compensated for most of our expenses. All opinions expressed are my own.